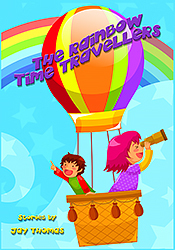 Seven educational stories by Jay Thomas, for children aged 5-10 years old. The younger brother and elder sister have such a close bond that a sudden change in the elements enables them to travel in time. Their travels and adventures together encompasspast and future events. Occasionally the travels develop into a sense of ‘double’ time travel, in which they become the age they would be at that future time. A very strange experience indeed! At a very young age the author committed a crime, in that he had great difficulty in learning to read. Many years later he was diagnosed as being dyslexic. These stories are written bearing in mind of the many misunderstood children who have difficulty in reading.